In biathlon, the source of much doping controversy from Russia over the years, foreign experts are beginning to notice a positive trend developing. The chairman of the International Biathlon Union's medical committee has praised Russia for its strident anti-doping efforts over recent years. Russia’s high doping numbers have long been a stain on the country’s reputation, and the issue has come to the fore with the country hosting a number of high-profile international competitions over the next several years including the Sochi Winter Olympics in February. But in biathlon, the source of much doping controversy from Russia over the years, foreign experts are beginning to notice a positive trend developing. "The IBU carefully follows the anti-doping work of all the federations," the IBU's chief medical officer James Carrabre told R-Sport. "If we see that some federation for various reason isn't coping, then we provide for extra testing at the international level." "Of course, there are biathlon federations that disappoint from time to time, but the Russian Biathlon Union is not among those countries that have problems in the fight against doping," said the Canadian, also a vice president at the IBU. Carrabre's remarks come a little over a month after two promising young Russian biathletes received bans for doping offenses. They were Nikita Marchenkov, a member of Russia’s team at January’s world junior championships, and Denis Vdovin, who has been on the podium at European junior level this year. The last major disqualification, however, dates back to 2009, when Albina Akhatova and Ekaterina Yureva tested positive for EPO during the World Cup in Sweden. "The RBU's anti-doping program has been in place for a few years now, and the IBU sees the results. ... 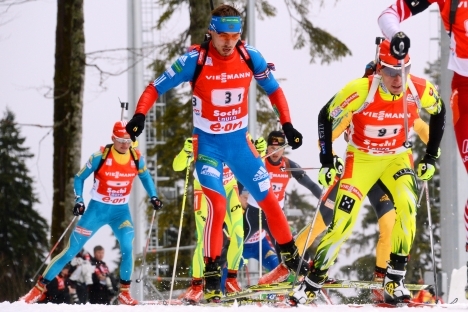 I am sure that Russian biathlon has nothing to hide, and the IBU has no concerns at all about doping in Russia." Outside biathlon, Russia has been hit with a spate of doping scandals over the last few months, including five suspensions for members of the London 2012 Olympics team. Discus silver medalist Daria Pishchalnikova was slapped with a 10-year ban last month for failing a doping test taken prior to the Games. In March, swimmer Natalya Lovtsova was hit with a two-and-a-half year ban for violating anti-doping rules.